It rained a little during breakfast this morning, the first rain we’ve seen in a couple of months. We collected Robert and headed off toward Mzuzu. 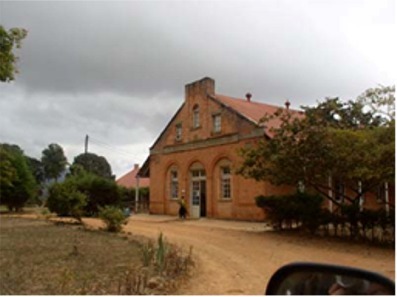 We stopped briefly in Livingstonia to have a look around. It’s a strange little town with orderly red-brick buildings set on the plateau overlooking the lake. 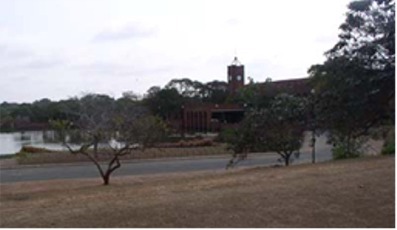 The town was founded as a mission station (not by Livingstone though) and currently houses a university. We arrived in Mzuzu at about 1130. There is no international ATM in town, so we filled out some forms for a VISA cash advance, which we were told would be ready in two hours. We had some lunch and went to a very modern internet café where Jen discovered that a friend of hers had won the bronze medal in the women’s triathalon in Athens. After we collected our cash we immediately spent almost $100 dollars of it on diesel. The supermarket was a bit disappointing, but we did pick up some nice fruits and veggies at the market outside. 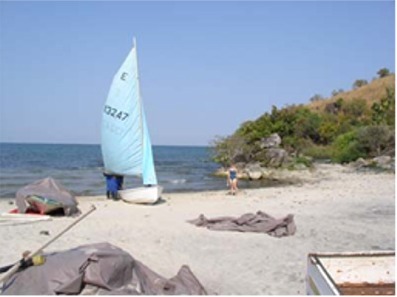 In the afternoon we headed for nkhata bay. 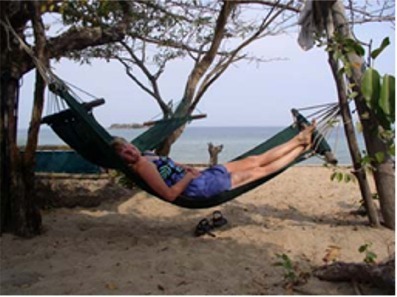 We checked in at Njaya lodge and went to see about a sea kayaking trip. 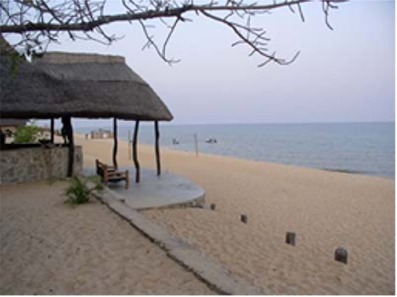 The trip to Likoma island won’t run again for another week, and the other trips didn’t seem as interesting so we decided to give it a miss. We spent the evening on the deck at the lodge and were treated to a beautiful view of the full moon rising over the lake. 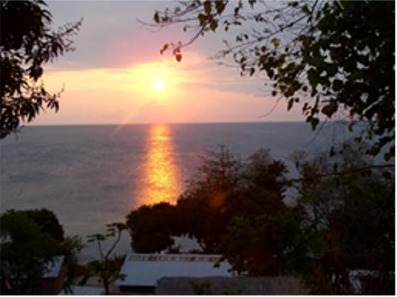 We watched a beautiful sunrise over Lake Malawi from our tent this morning. After breakfast we decided to go about 50km south to Chinteche where the beaches are supposed to be a little nicer. 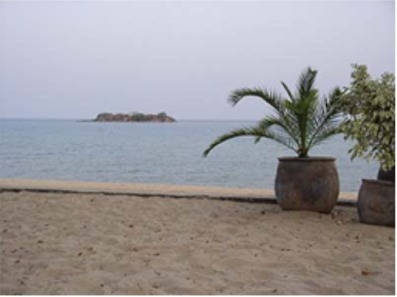 We went to Kande beach first and set up a ½ day “refresher course” with the scuba diving outfit there. Kande caters almost exclusively to overland trucks, and as there were 3 in evidence while we were there we decided to camp about 7km north at Makuzi beach. We were the only guests there and we spent the afternoon relaxing, snorkeling, and puttering about in a little sailboat they have. We enjoyed sundowners followed by dinner on the deck overlooking the lake. We scheduled another dive trip to the island for this afternoon, so we planned to just hang out on the beach and read in the morning. At about 1130 the wind started to pick up so we decided to rent one of the sailing catamarans they have. I’ve never sailed a cat before, and it was great fun. After lunch at the restaurant associated with the campground, we headed out for our dive. Ben showed us their “wreck,” an old VW thing sunk intentionally to add interest for divers. The visibility was a bit better this afternoon, and the diving was like swimming in an aquarium. After our dive we decided that we’d had so much fun on the sailboat in the morning that we took it out again. We enjoyed beers on the beach and a good meal of fried fish at the restaurant. After dinner we met a group of travelers headed for Ethiopia. There were 7 of them in two vehicles! And we thought we were overloaded. 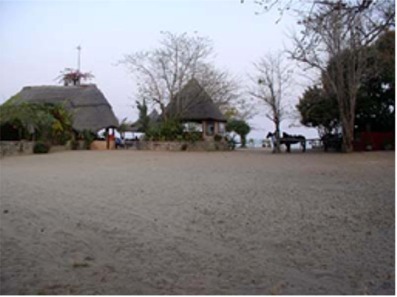 We left Kande this morning planning to visit an American Peace Corps volunteer whom we had met in Livingstone (Zambia). On the way we stopped at a pottery factory near Nkhotakota. They make some very nice stuff and it’s pretty cheap. We managed to locate some more space in Rafiki so that we could buy some. After lunch on the beach, we headed inland, eventually locating Kathy’s home near the town of Mtunthana. She wasn’t there when we arrived, but Aaron who helps her out, let us into her house. We talked with him for awhile until she returned. We talked with her for quite awhile and learned a lot about Malawi and the Peace Corps in general. Living in a single place for a long period has given her a depth of knowledge that we haven’t been able to get traveling, and it was very enjoyable to talk to her. She lives in the same style of house that the locals use. 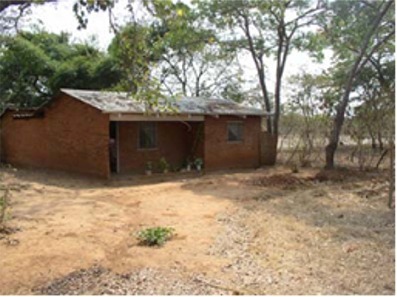 It does have electricity (most of the time) and running water, but in general Kathy (and all Peace Corps volunteers) live at the same level economically as the societies in which they are placed. Kathy made us breakfast this morning. Apparently it is what the locals normally eat and amounts essentially to rice pudding. She added cinnamon to it and it was quite good, although much different from what we’re used to for breakfast. She and Tommy, another volunteer, showed us around the nearby Kumuzu Academy. 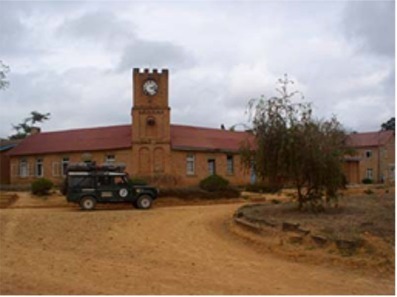 The school was founded by a previous president of Malawi and was modeled after Eaton College in England. It was like stepping out of Africa briefly, with it’s auditoriums, modern computer labs, and enormous library. Today was the first day of a new term, and we saw a parade of brand new Landcruisers and Mercedes go by as parents brought their kids to school. The original idea was that the top two students from each district in the country would be awarded scholarships to the school, but that has been done away with in favor of cash, and now only the very wealthiest Malawians (and foreign students from other parts of Africa) can attend. There is a garden that grows vegetables, and apparently the school can be entirely self-sufficient for up to six weeks. Kathy and her Malawian counterpart Kevin are heading to Lilongwe today to attend a training session on how to teach HIV/AIDS issues, so we offered them a ride. We arrived in Lilongwe at about noon and said goodbye to Kathy. There don’t appear to be any international ATMs in town, so we’ll have to wait until tomorrow (Monday) to get cash and buy fuel to continue our journey. We found a place to stay and spent the afternoon showering and checking our email.